A couple weekends ago, I missed out on a flea market I wanted to go to because I really wanted to attend my sister's graduation and Tulip Time. 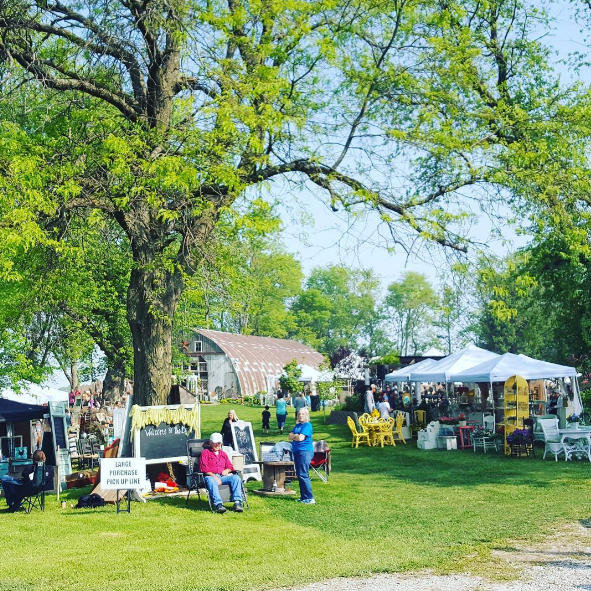 So I was thrilled when I heard of the Spring Flea and Fair at The Barn in a nearby town. I got up early Saturday morning, grabbed breakfast pizza and an energy drink from the gas station, and headed out onto the country road. I spent a little over two hours at the flea market. First, I wondered around and checked out all the vendors. Then, I made another loop and bought some things. 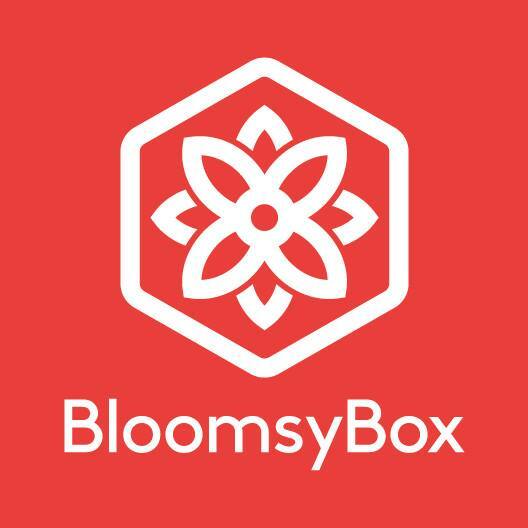 I set myself a strict cash budget even though many of the vendors accepted credit/debit. 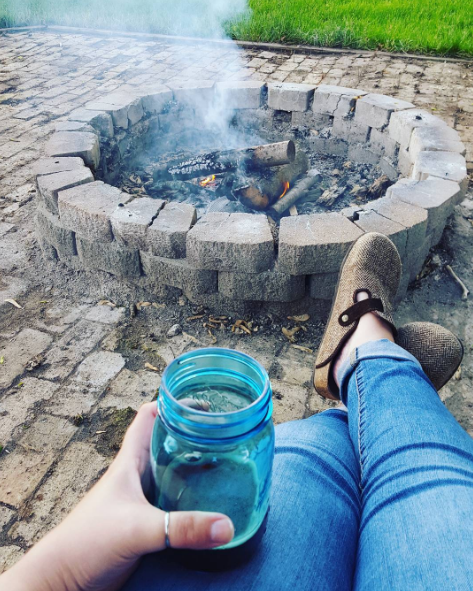 There were a lot of pretty things I wanted – and even more things that gave me great ideas to DIY myself! I did end up buying several things and didn't even spend all my moolah! There were a lot of great Iowa-themed items and decor. T-shirts, signs, and wall decor in the shape of our beloved state or sporting adorable sayings like "Is this heaven? No, it's Iowa." and "Iowa born and raised." 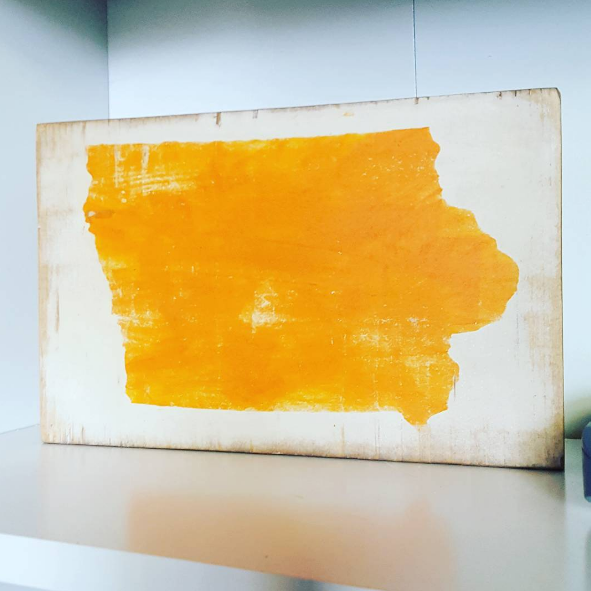 I think I'll be DIY'ing my own big Iowa sign, but I couldn't resist picking up this little plaque in orange for my living room. The best part about this flea market is that it introduced me to a lot of local shops in the area. Since I'm new to this rural part of Iowa, I haven't yet discovered all the antique shops and handmade goods stores. These wax melts came from a little shop that's only a half hour down the highway. 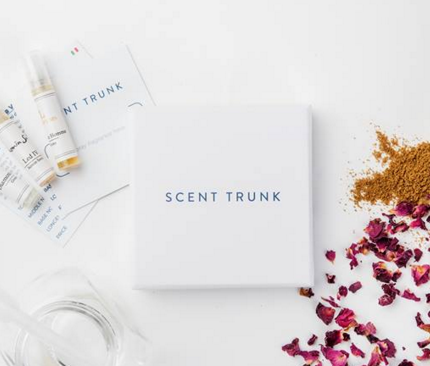 The vendor was such a lovely gal, who caught me sniffing the lemon cake scented melts. 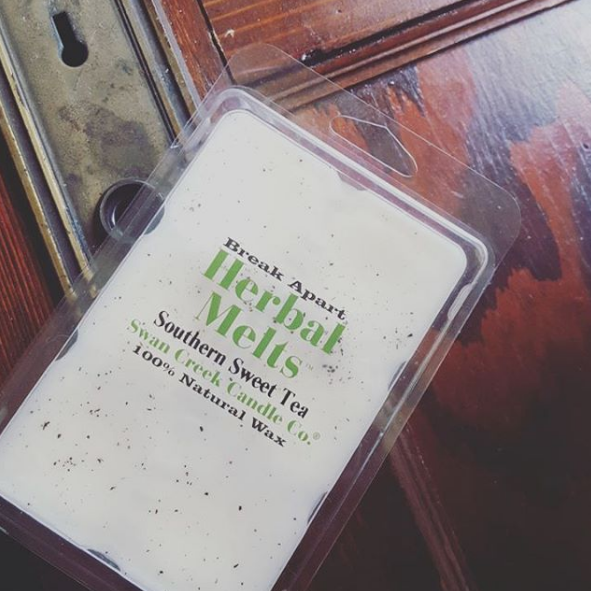 She pointed me in the direction of these ones that smell like Southern sweet tea – and I had to have 'em! 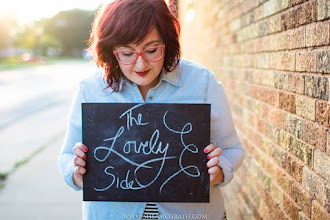 I'm not "Southern," but I'm from Southern Iowa... and sweet is a thing there, too! I loved my grandma's sweet tea and I can't wait to melt these and fill my house with the smell! I've been on the lookout for a stepping stool to have around the house. With ten-foot ceilings and high-up cabinets, I often can't reach things. And while we have a plastic/metal utility stool that we keep in our basement stairwell... I wanted something cuter to have sitting out. 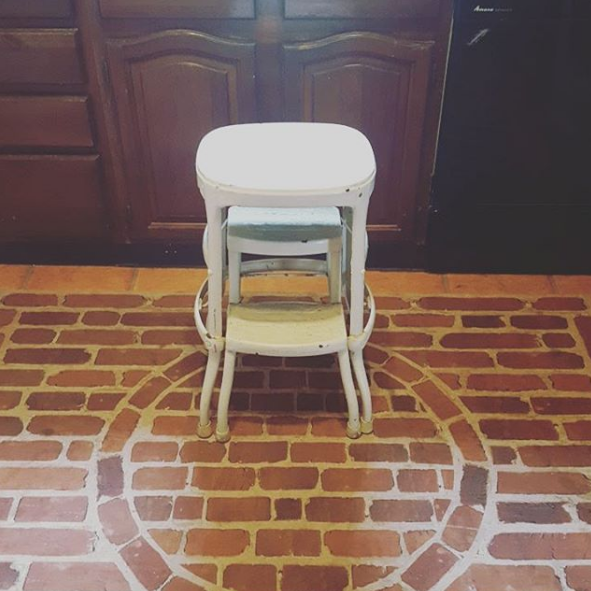 This little vintage stool was perfect! And only $24. It's been painted cream, which I like... but it might end up spray painted a brighter color in the future. Since it was the last day of the flea market, vendors were happy to go down in prices. Nearly every stand I went to, the seller said something along the lines of "Make an offer! I'm willing to lower prices!" This mirror caught my eye on the way in. It's really old and I love the timeworn patina on the mirror surface. And the little flower details in the corners match the wood trim in my house and on my dresser. On my way out, I noticed that the mirror was still there. I hovered there a minute or two pondering the $40 price tag, then the seller said he'd go down to $20. He even helped me take the mirror and my other things over to the line to wait for a golf cart ride to my car. I love Iowa nice! I originally wanted someone to go with me to the flea market. But friends were busy and G was working, so I ended up going alone. I'm actually glad I did. 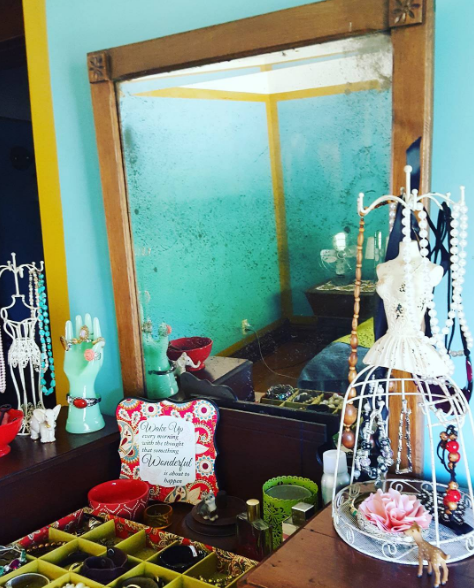 It was nice to get out and do something fun on my own – to take my time, wander around the antiques and vintage things I love so much, and be alone with my thoughts and ideas in a bright, colorful, creative place. 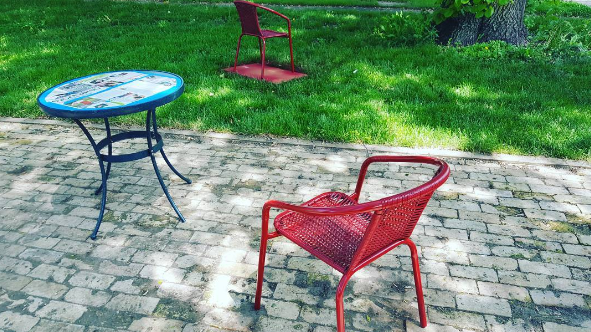 When I got home, I spent the mid-day spray painting some patio furniture. I haven't spray painted in sooooo long – and it was so therapeutic. Haha. I think it's the instant gratification of making something bright and colorful that does it for me. In the afternoon, my mom and sisters came up! 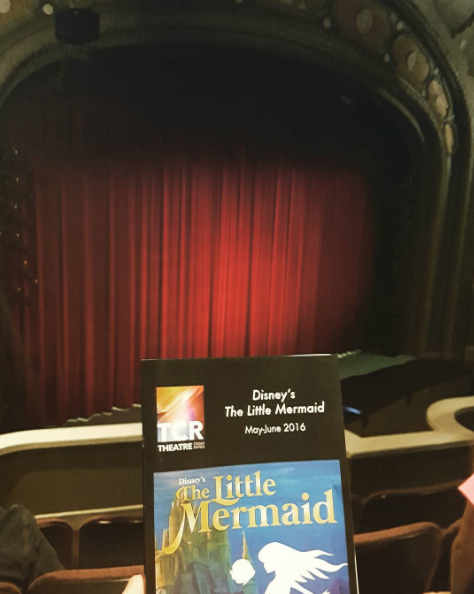 We drove the hour to "the big city" to get some things for my sister's wedding, grab a bite to eat, and see the community theatre's production of Disney's The Little Mermaid. I love the theatre – and the local actors are so talented! I've seen Les Mis, The Great Gatsby, and Into the Woods here... and The Little Mermaid was fantastic, too. They used flying equipment to make the actors look like they were swimming upward. During "Under the Sea," they filled the auditorium with bubbles! It was magical and I'm so glad I got to spend some time with my mom and sisters – and show them the house! Any fun flea markets or festivals?